We're putting our own spin on back to school with a tech-inspired round-up of conscious buys, curated by our favorite smarty, our founder Lauren Bush Lauren. Whether you're a student, a parent, or someone who still uses back to school season as an excuse to shop ten years after graduating, there's a Team FEED-tested find here for you. Portable, reusable and recyclable: three words we want to hear when it comes to our water bottles. Klean Kanteen has long been our favorite on-the-go vehicle for hydration thanks to its uncanny ability to keep our coffee hot in the winter and iced in the summer. You'll find this cute mini bottle in our commuter totes at all times. Swear off your 3pm coffee fix for this all-natural energy boost. Because of the blend of premium ingredients like green coffee bean, electrolytes and antioxidants inside, one serving is all it takes to feel immediately energized before a big meeting or test. Whether student, parent or neither, something about the back to school season makes us feel the need to stock up on snacks. We've partnered with Mouth Foods to offer two seasonal bundles of small batch finds. Ditch the goldfish, and support indie makers while you're at it. Natural hand sanitizer spray, via Honest Co.
Tricolsan, Benzalkonium, Glycols, Parabens. Recognize any of these words? Neither do we, which is why we were happy to learn that this natural hand sanitizer spray from the Honest Company is free from all of the above. Additional plus? Its refreshing citrus sent. 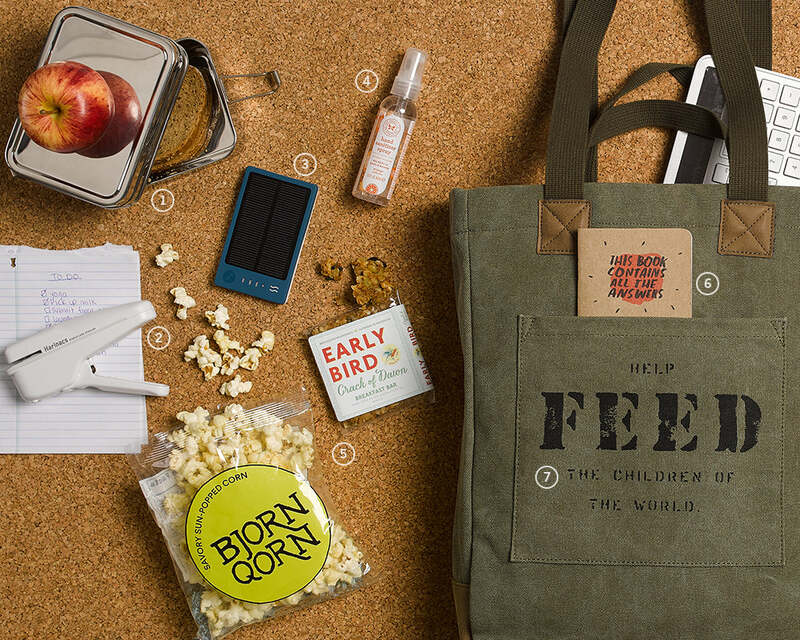 We thought through every possible commute when designing this functional hero of bags. Bike to class? The Commuter Tote fits perfectly in a basket. Ride public transportation to work? An interior laptop pocket will keep your prized possession safe. Drive? We'll try not to envy you while we point out the exterior pocket keeps essentials in place, so you never have to dig for your keys again. The moms on our team swear by this stainless steel bento box for their littles. It's big kid approved as well. We’ve found it perfect for those days that back-to-back meetings or classes make it impossible to make or buy lunch. Be part of the renewable energy revolution in your own small way with this brag-worthy gadget. All it takes is some time in the sun (hello, perfect excuse to leave the office) to power your phone. After learning that 1.2 billion watt-hours are consumed everyday to power smartphones in the United States, we're convinced this solar charger is worth the investment. World-class musical instruments are made from wood. Why should ear buds be any different? The makers of these one-of-kind Bamboo earbuds have a point there. But if we’re being honest, they had us at Bamboo. Out of Print does more than inspire us to crack open a good book with their nostalgia-inducing graphic tees. Each purchase helps to fund literacy programs and book donations to communities in need. It also supports the authors, publishers and artists who made these iconic works an integral part of our lives. We were pretty enamored with this office gadget when it arrived at our office last week. How does the magic happen you ask? Apparently, the stapler cuts tiny strips in documents and folds them together--completely metal free! We'd recommend only using for smaller stacks of paper. Term papers or big presentations probably need the real deal. Our tech-savvy guide would not be complete without a solar powered keyboard. Do away with you power cord. All you need is a little bit of light to power a full day's work. In the spirit of back to school, how cute is this collegiate-inspired cap from Love Your Mellon? 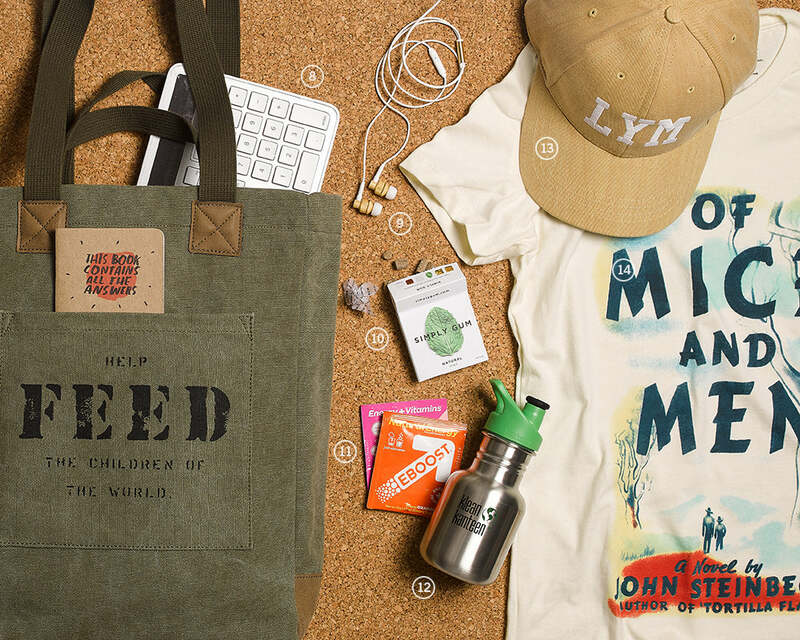 Cuteness aside, there is one very important reason why LYM made it onto our list of conscious buys: 50 percent of proceeds from each product is donated to the brand’s nonprofit partners in the fight against pediatric cancer. A little wishful thinking never hurt anyone, right? We're stocking up on this 100% recycled paper notebook from Portland-based Scout Books. The cheeky cover is the work of famed LA author and illustrator Dallas Clayton, which we think is totally cool. Who knows, maybe it will help you land that big presentation next month.